Holy sparkle! 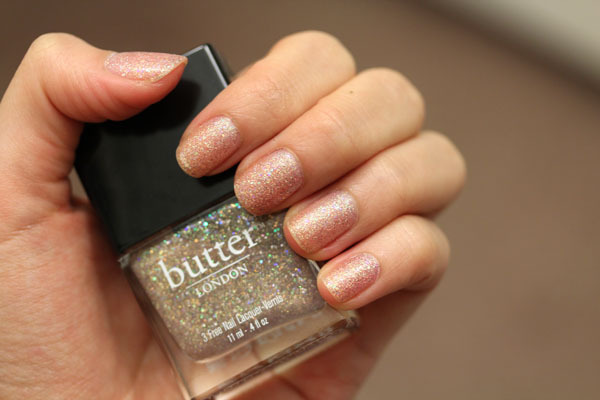 Butter London dishes up holiday cheer with oodles of glitter. I grew up in a tropical climate, so we never had four seasons, much less snow, and my family does not celebrate Christmas. Thus, year-end festivities were relegated to tacky mall decorations and monthlong blaring Christmas carols (which I secretly enjoyed - I used to be part of a caroling troupe singing at malls), snow globes and glitter sparkles on every corner. 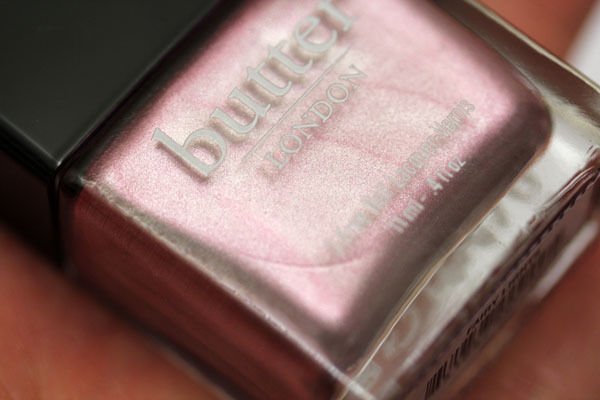 But really, you don't need my dose of nostalgia to enjoy the new Butter London Holiday collection polishes. Here are some pictures to illustrate my point. The collection consists of three nail lacquers. 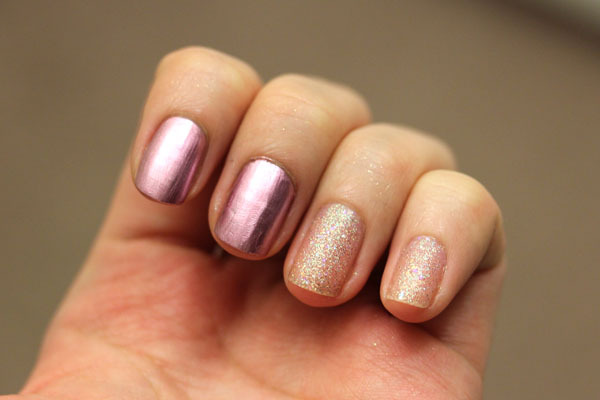 Tart With A Heart contains pink and blue reflecting glitters suspended in a pale gray-pink base, Fairy Lights is a "liquid metal" rose pink, whereas The Black Knight is pink, silver, and blue glitters in a black base. The naming of the polishes confused me. I thought Tart With A Heart should have been called Fairy Lights considering the explosion of reflecting glitter that comes with the polish. It's like a Christmas party on your nails. 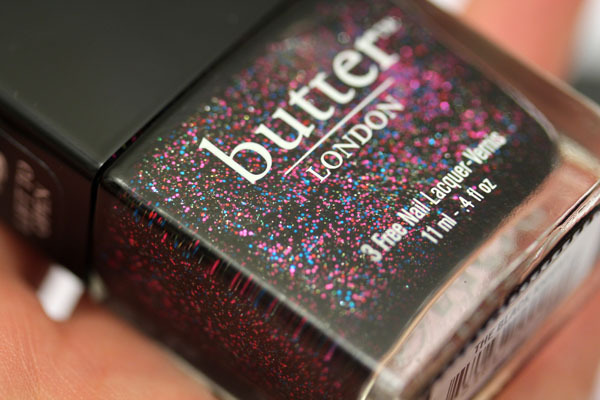 While it doesn't bother me, I thought you should know that like all glitter polishes, Tart With A Heart and The Black Knight comes with serious grit, even after smoothing a top coat over it. These two are easy to apply, and the glitter spreads evenly as you pull your brush along. They also seem to dry a lot quicker than usual polishes. 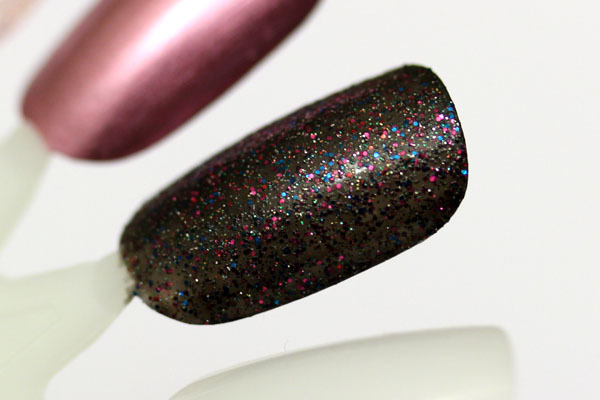 While Tart With A Heart only requires one for sparkle aplenty (I did two, as you might expect of me), The Black Knight requires at least two coats to achieve the above opacity. Fairy Lights proves to be the only one out of the trio to give cause for concern. 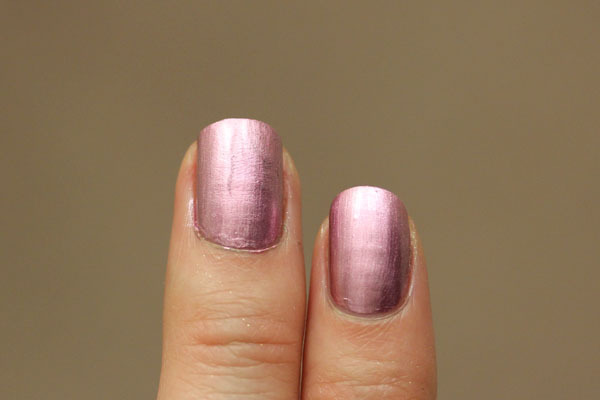 The age-old problem with metallic polishes is visible brush strokes, as in you'll most likely have them. I found that the best way to tackle that issue with Fairy Lights is to not scrimp on polish. Thick is the keyword for success. Compare the application on my middle and index fingers above, where the middle finger was painted with two thin coats, whereas I oozed polish onto the index finger. While one coat was enough to achieve opacity, I definitely suggest two coats for this. I know glitter polishes are done by every brand under the sun for holiday, but I think The Black Knight can be a huge contender in that massive field. I personally am partial to Tart With A Heart because it reminds me of swirling snow globes and looking at it saved me from biting a (very disrespectful) person's head off. Something about pretty polish distracts me and calms me down. One last note about these polishes: I keep hearing people groan about the torture of removing glitter polish but I didn't find it all that difficult. I soaked a cotton in nail polish remover and pressed it onto my nail and waited for 5-10 seconds, then proceeded to wipe it off like how I would any other polish. Worked like a charm. 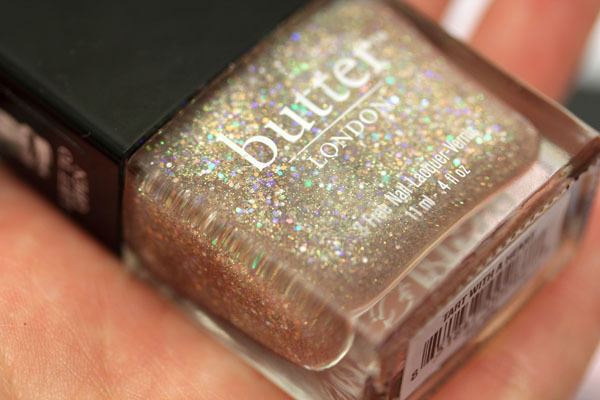 Butter London Holiday 2011 retails for $14 each and is available at butterlondon.com and select other retailers. 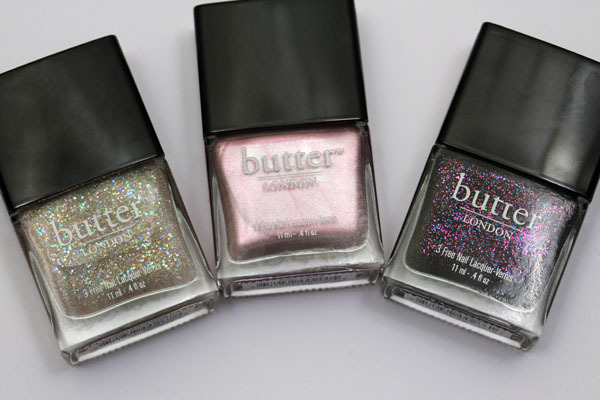 I usually purchase Butter London from ulta.com (though it doesn't seem like this collection has arrived on the website yet). The products in this post were sent to me for review purposes. I agree with you on Tart with a Heart - my fave! I love Tart and Black Knight, two of my fave polishes! I don't care how gritty it is, The Black Knight looks awesome! omg fairy lights is gorgeous! i love how there is no streaks for such a metallic finish! the finish seems so fine. Gorgeous pics, thanks for the swatches! Black Knight is definitely something different, and Tart With A Heart is very tempting. Now I need to go find these somewhere..
Just ordered these three today, and now I'm even more excited about them as I've seen your pics and reviews. Thanks!